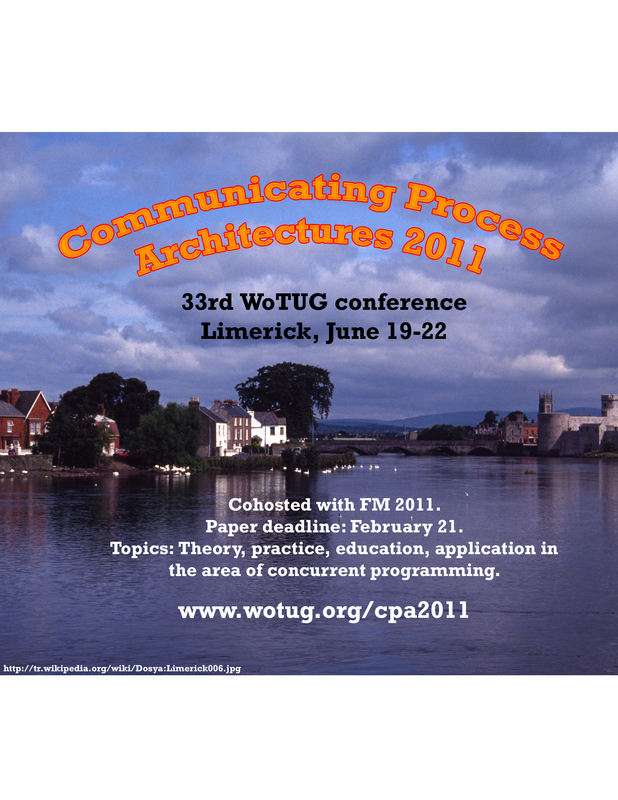 Communicating Process Architectures 2011, the 33rd WoTUG conference on concurrent and parallel programming, was hosted by Lero (Ireland's Software Engineering Research Centre) at the University of Limerick, Ireland. CPA 2011 ran from Sunday 19th June through Wednesday 22nd June in the university's Robert Schumann building. All the papers and presentations from CPA 2011 are available from the WoTUG paper collection. The CPA 2011 proceedings are published by IOS Press. As with CPA 2009, CPA 2011 was co-located with FM 2011, the 17th International Symposium on Formal Methods. Also co-located this year was SEW-34, the 34th Annual IEEE Software Engineering Workshop. The Conference Dinner took place on Monday evening at Knappogue Castle. Neither of the above sets of bullets are exclusive. CPA welcomes submissions of original papers on any aspect of concurrency in Computer Science. Traditionally, concurrency has been taught and experienced as an advanced and difficult topic. A thesis underlying this conference is that this tradition is wrong. The natural world operates through the continuous interaction of massive numbers of concurrent autonomous agents at all levels of granularity (astronomic, human, atomic). Computer systems have to operate in this world and, therefore, have to model it at some appropriate level of abstraction. To do this simply, it seems natural that computer systems should also operate through similar levels of concurrency. If computer science finds this hard, it may not be doing it right! Concurrency engineering must mature into a simple discipline that can be used every day to simplify the way in which we do computing, as well as enhance the performance of what we build. The commercial reality of multicore processors means that concurrency issues can no longer be ducked if applications are going to be able to exploit more than an ever-diminishing fraction of their power. This is a mean, but very forceful, reason to take this subject seriously. But we should not be fearful. Concurrency does not need be motivated and employed only for performance – concurrency is our friend and too important to ignore. WoTUG provides a forum for the discussion and promotion of concurrency ideas in computer science. It organises specialist workshops and an annual conference. CPA 2011 is the eleventh conference under the name of Communicating Process Architectures, and the thirty-third in this series of WoTUG conferences. CPA 2009 took place as part of Formal Methods Week 2009 at the Technische Universiteit Eindhoven. Details of earlier conferences are here.